Thread: To "re-gift" or buy a new one? Alright, here's the skinny. I've got a 5 y.o. boy who has a cheap bolt action .22 in the cabinet. I've also got a daughter due in five weeks. So do I plan on her (Alexandra) using the existing .22 to learn on, assuming the boy (Ben) will have moved on to something a bit less, well, Romanian Surplus? Or do I plan to buy another .22? What I'm looking for is practical advice from parents who've done this rodeo before. Will I be wasting my money, as in Ben moving on to a more usefull .22 or shotgun, by the time Alexandra is ready to start learning? To me, this is mostly a question of designating the .22 as "the kids' gun" or as "Ben's gun." If it's Ben's gun, I would ask him if he minds if his sister also uses it to learn. And abide by what he says--it's his. If he says it's okay (and most kids can of course be gently corralled into that answer ), then wait until your daughter is old enough to help you decide on a gun for her. Who knows? She might want a pink 10/22! You give it to Ben it's HIS!!!! 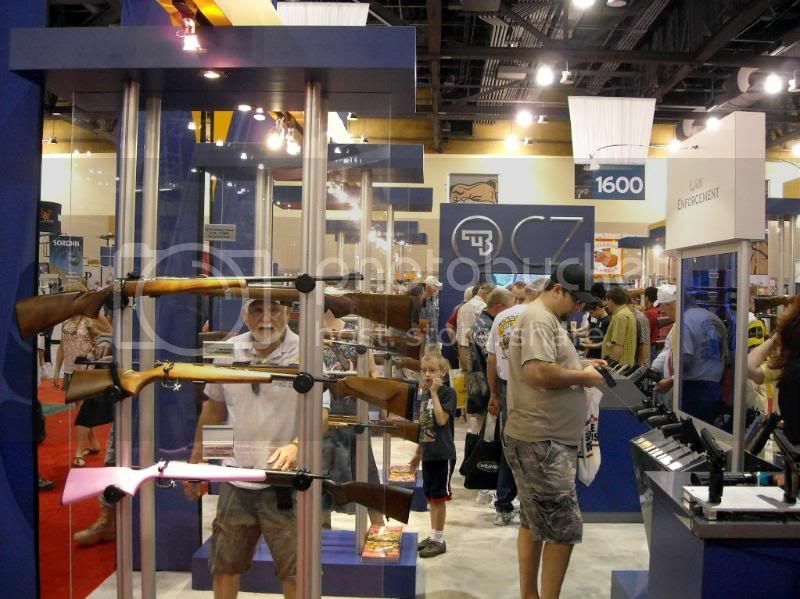 There is that new CZ Scout .22lr single shot in the nifty pink stock...look down lower left. I agree with AFS. A child's first gun is a special thing. I still have my first little bolt .22 and, for sentimental reasons, it's one of my favorite guns that I own. I look forward to giving it to my oldest son when he's old enough so that hopefully he will get as much enjoyment out of it as I did. Let that be Ben's gun and buy Alexandra her own. Yeah, looking back to when I got my first rifle, I can esily see it that way. Even if he does (and I expect will) get something more usefull (better sights and possibility of optics) it would be a shame for him to lose his first gun to his kid sister. Good plan. You want your kids to be gunnies, give 'em their own starter guns! That will plant a seed that will (hopefully) grow throughout their lives. And while you're at it, teach 'em that Democrats are evil people who would take those guns and their freedoms away from them. Last edited by rondog; June 15th, 2009 at 01:35 AM. My new baby girl will get her own when she gets old enough. I figure that the gun will grow with her( I have the fullsize stock in the closet) and give her a start on her own collection.
" I was trying to blow his brains out is what I was trying to do"
I still have the first gun that my father gave me 30 years ago. It is probably valued at less than any gun I own. But it is worth more to me than all the others put together. I cherish the memories of him giving it to me, teaching me how to shoot it, and us hunting together with it. So my vote is to spring for another gun for your daughter! Now, I don't really see anything wrong with letting her use your son's rifle to see if she is even interested it the shooting sports. Then if she is, she gets her own gun. If she doesn't care for it, then you didn't have to buy a gun for nothing. This thread got me thinking. My 10 yo son has a marlin 60, and my 5 yo daughter has a little pink cricket. I had initially planned on giving my son the 10/22 when my daughter was big enough to handle the marlin, then pass the pink one down to the now 2 yo daughter. But this was all without taking into account the "sentimental" value of their "first gun". I guess only time will tell, but in all reality I think all of the guns in the cabinet are actually mine and the passing down effect could help teach them that guns are only objects. Additionally, when they start pumping out grandchildren, I think perhaps gifting the guns (your mom/dads first gun) on to them is something I want to reserve for myself. So ultimately I am VERY undecided. you have a few years to see how it works out, by age ten, ben maybe lookin for something different. In our family, there is one smaller .22 made by H&R that is a very good rifle, but very small, every kid has grown up shooting that since my brother and I started on it in the mid 60's. Its just passed down, and its a big deal on the day the current holder walks it over to the next in line and says, here, your old enough to keep this, and they point out every person that has had it, how well it has been kept, and how its now their job to keep it until the next in line is ready. Usually happens at a B day or Christmas. pretty cool tradition to start. A redneck's famous last words...HEY DUDE, watch this! My wife gave birth Wednesday morning at 10:06. Little Alexandra Shea is 6 lb, 12 oz and 18" long. She and Kim are doing well, the doctor sent them home yesterday evening. The Garlich clan (all four of us) spent our first night all under the same roof. Now to go looking for another .22 rifle. Congrats to you and Mom! We need photos now, ya know! My wife has the gun her father gave her all those years ago. It's her gun. A shotgun. Fine example of a Stevens/Savage pump .410 from the late '50s.